The new episode of America’s Got Talent: The Champions (airing tonight on NBC, check you local listings) and will feature the magic of Shin Lim, whose performance is the officially leaked clip of the week, and illusionist Cosentino. Speaking of TV, Matt Johnson was on the new CBS talent show World’s Best last night. Did Matt go on to the next round? Well, we’ll have to tune Wednesday (the show’s regular night) to see. If you missed the premiere it will be re-aired Tuesday on CBS. One surprise was that Barry and Stuart’s Stuart MacLeod was among the panel of global judges. The new issue of Vanish Magazine is out with Matt Johnson on the cover. Download your free digital copy (or buy a physical one) on the mag’s website. Finally, NorthJersey.com (via MSN) talks to Michael Turco about his career and battle with leukemia while the Daily Independent features an interview with Bill Blagg. The first part of the Jim Rawlins magic collection goes up for auction at Potter and Potter on February 23 but absentee bids are already being accepted. Learn more about the auction and download the catalog on the Potter and Potter website. Contraband International recently posted this video of Maddox Dixon on their YouTube page. Maddox also happens to be on the latest Vanish Magazine cover; you can download your free electronic edition here. 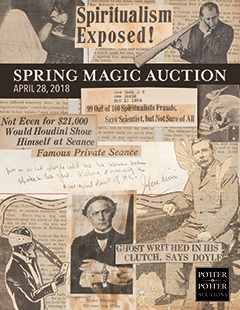 Potter and Potter’s next magic auction, the Spring Magic Auction, is scheduled for April 28. Not limited this time to a single collector’s items, this article will have several items of interest to the Houdini collector. Chief among them are, no doubt, two recently discovered Houdini scrapbooks. You can download a PDF of the catalog, get more information and learn how to bid (live or online) on the Potter and Potter website. Magic Master Summit 2017 – Opt-In Video v1 from Thrillusionist on Vimeo. The 2017 Magic Master Summit is scheduled for November 13 -17. This free, online weekend of lectures aimed at the professional (or looking to become professional magician) is organized by David DaVinci and will include over two dozen successful magicians presenting over 30 sessions, including Jeff McBride, Michael Finney, Murray SawChuck and Bizzaro! This year’s event also includes an online magic competition which registered Summit attendees can also view. You can get all of the details and register for free here. Registration also gives you a nice downloadable selection of sample contracts and other useful documents. That is the news about the 2017 Magic Master Summit. Everything from here on is my (Michael’s) personal opinion! I have not been paid or even asked to review or endorse this event. I am not sure how it will all work this year, but as I recall each lecture was available to registrants for a certain amount of time (a couple days, maybe a week) so you did not have to be sitting at your computer for three solid days to catch all of the lectures. There was also the opportunity to purchase permanent access (and downloads) of the lectures after the 2016 Summit. I saw several lectures last year and meant to purchase the lifetime access at the time but I was knee deep in real life so I didn’t. When David’s wife was having here medical troubles after an on stage accident at sea, I jumped on their discounted access fund raiser and have not regretted it. The 2016 Magic Master Summit was well worth my time and money. This year features a couple of people I have seen lecture live, so I think I am even more excited! If you have serious performance aspirations or are already performing register for this event today. NEWS FLASH: Live Stream Last Ringling Brothers Circus Sunday! Sunday night (May 21, 2017) the legendary Ringling Brothers and Barnum and Bailey Circus will perform its last touring show in New York. They have announced that they are live streaming this historic performance on YouTube and Facebook Live Sunday evening at 7 PM Eastern time. This truly will be the end of an era. Free Stuff! New Conjuring Arts’ Book Club Download! Somehow I missed an email announcing it, but there is a new free PDF download of a classic magic text over at the Conjuring Arts Store. This month they are offering T. Nelson Downs’ Modern Coin Manipulation, a book from one of the greatest con magicians ever, as part of their Free Magic Book Club. Claim your free copy by heading to the Conjuring Arts’ site today.